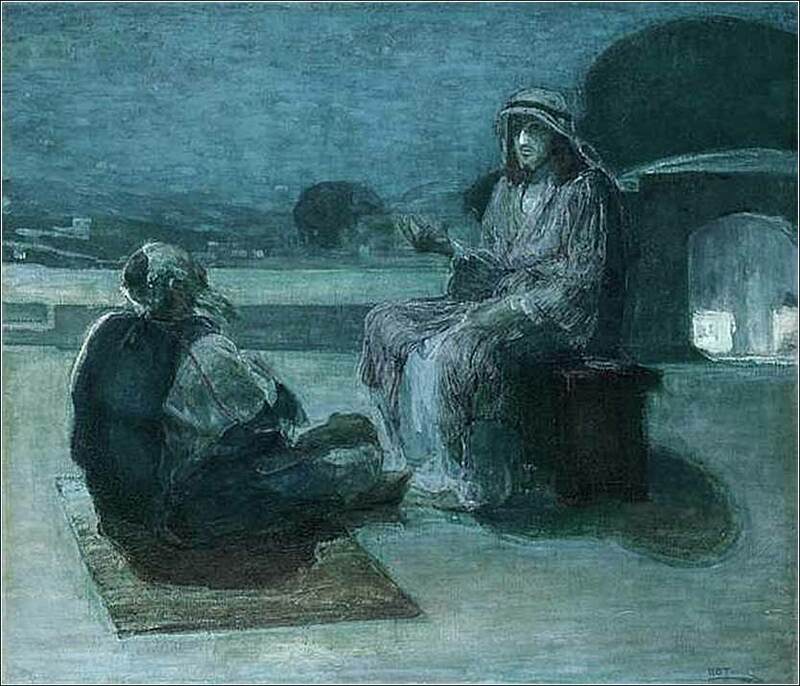 Jesus and Nicodemus by Henry Ossawa Tanner, ca. 1927. Tanner was the first internationally-recognized African-American painter, and perhaps it was racial sensitivity that led him to give Jesus such realistically Semitic features. If you dislike bagpipes — they only last a minute. This is worth waiting them out. 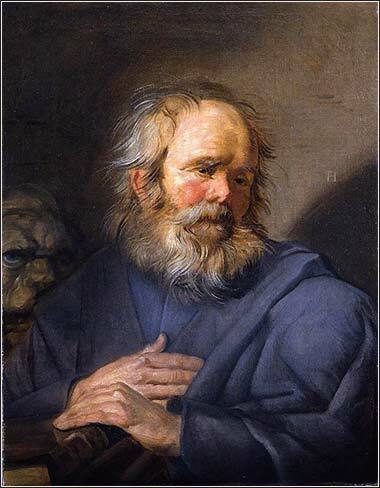 Mark the Evangelist by Franz Hals, ca. 1660. "Christianity is called a spiritual walk. It’s not a run and it’s not a jog. It’s a walk you do from day to day and that makes you stable." Then the disciples came and said to him, “Why do you speak to them in parables?” And he answered them, “To you it has been given to know the secrets of the kingdom of heaven, but to them it has not been given. Why, the disciples ask, is Jesus indulging in such childish-sounding story telling? Because, he answers, the listeners are not as advanced in their knowledge — the secrets Translating this as “secrets” is a poor choice of words. The Greek word (musteria) not only means “mysteries”, but is even the root of the English word. Christ's teachings are by no means a secret! As cruel as this sounds, we all know how true it is. Think of two students in a high school French class. One studies diligently and learns what is taught; the other goofs off, too busy texting his friends to be bothered, or simply not interested. Ten years later, our apathetic student will find that even the little French he managed to learn in high school has fled his mind; he is the one who “has not”, and what little he has is indeed taken away. Meanwhile, our star pupil will not only remember what he was taught, but is also more likely to be offered (and be interested in taking) more advanced courses. So Christ speaks in parables to help those in the beginners class. People who have “ears to hear” will be able to grasp what he is saying, even if the subject is new to them. He was speaking to farmers or, at least, people intimately acquainted with agriculture; in ancient times, the percent of the population involved in food production was enormously higher than it is today. Stories about growing food and baking bread thus made his message available to the poor and uneducated. The Biblical term Language buffs might recognize this as a “metonymy”, referring to one thing — the ability to learn by listening — by a physical object associated with it. Even more technically, one might call it a synecdoche, where something is identified by one of its component parts: “I have mouths to feed” by “putting bread on the table” are two examples. “those who have ears to hear” may sound dated, but we still say a person “has an ear for French”, and it means nearly the exact same thing. Note that “an ear for French” does not necessarily refer to a native gift of higher intelligence. The stupidest person in France can speak French. Christ did not come to earth to save smart people. He came to save those who were open to his message and willing to learn. Any gift of knowledge can be developed, and any gift ignored and lost. So, Jesus speaks in parables because there are people who have ears to hear, but who are unlettered, poor, and not given to dealing with philosophical principles. He speaks so that those open to his message will understand, no matter what their education. Once they are able to understand what He is saying, they will continue to learn. They will seek, they will pray, they will listen. We are the ones who “have”, and the more we have, the more we will be given; in our minds, in our lives, in our souls. Every Bible verse we grasp makes us hunger for another. Every temptation we conquer gives more strength to withstand the next; every temptation to which we succumb weakens us. Proverbs 31:10-12 (KJV): Who can find a virtuous woman? for her price is far above rubies.